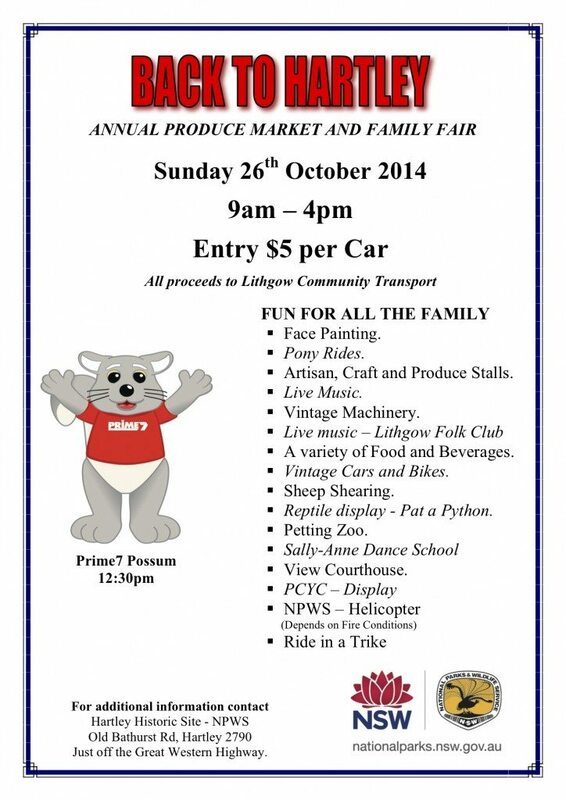 Entry fee $5 per car supporting “Lithgow Community Transport”. In 2012 our event was a huge success with an estimated 4,000 people in attendance and raised $5,100 for local charities. Visitation numbers reduced in 2013 due to bushfires locally and across the Blue Mountains. This year 2014 we hope that we aren’t re-living the fires of last year and once again our attendance and success will be even better than our 2012 year. Feedback from previous stallholders and participants at both events was both positive and constructive for the staging of future events. Participants responded favourably to the quality and range of produce and merchandise for sale, entertainment, atmosphere and range of family oriented activities. “Back to Hartley” will continue as a partnership with the local community to raise awareness of the site and its history, to raise funds for local charities/non profit groups and to promote the wonders of the Central West. The event has a great atmosphere of family fun with lots of other activities on the day including Archery, Pony rides, Trike (motorbike) rides, sheep shearing, reptile show, vintage cars, motor bikes and machinery there will be dancing performances and live music to name just a few. “Back to Hartley” will provide an outstanding opportunity for locals and visitors alike to access the large number of cultural and community groups which operate in the region, as well as finding out how to become more involved in community life.